I have a confession. I’ve gone solo diving before. (Mom, I’m sorry.) I’ve been a scuba instructor for eleven years, diving since I was 15, and have done over 4,000 dives, I believe sometimes I am more comfortable underwater than I am on land (seriously, fish can be much easier to get along with than people). 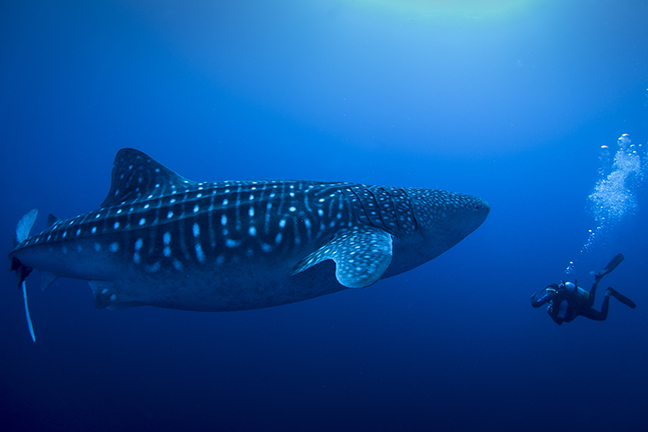 Close encounter with a whale shark at the Great Barrier Reef. Photo by Brandi Mueller. There is much controversy on this subject, and as my disclaimer, these are my personal thoughts and experiences directly related to my recent trip with Mike Ball Dive Expeditions (MBDE). MBDE was probably the first and currently one of the few commercial dive operations that allows certified solo divers with the required safety equipment to dive alone on their trips. Solo diving is becoming quite trendy right now, and more shops and boats are starting to teach and recognize solo certifications. MBDE is no stranger to solo diving. Mike Ball actually pioneered the practice in 1997, creating his own course for his dive boats, in order to teach divers safe solo diving; and he promoted it to guests. These days, the operation is teaching the SSI Solo Diver certification onboard, which I took, completed, and then dived solo for most of my time with the operation. Nothing is worse than showing up for the trip of a lifetime on your own than being forced to be paired up with a dive buddy who may be at a different experience level or have different dive goals than yourself. For me, the solo course was a no-brainer. I am an avid underwater photographer, with the tendency to spend excessive amounts of time with a single fish. Dive buddies (those who are not photographers of the similar obsession) are annoyed by me. Dive guides hate me, because they are leading a dive with several people, and I am the troublemaker who stops to take 20 photos of a butterflyfish. Pretty soon, they have continued on and lost me. The course is relatively straightforward; there is a book to read, some questions to answer and skills to do underwater, such as showing the ability to switch to your back-up air source, navigation and good buoyancy. Pre-course dive requirements include being an advanced diver, having at least 100 logged dives and being 21 years old (or 18 and a certified dive professional). The goal of the course is to make a diver more self-sufficient, which is great whether a diver intends to dive solo or not. The more confident a diver is in their ability to handle any situation with or without their buddy, the safer they (and their buddy) will be. After taking the course, the instructor and other crew members make it known that you do not have to dive solo every dive. You can take the course and still dive with the dive guides, or they will pair you up with a buddy. Also, the dive guides do not shun you for being a solo diver; if they find something cool, and you are in the area, they will still signal you over and show the interesting critter to you. Mike Ball was kind enough to have a coffee with me post-expedition, and I had lots of questions for him on his thoughts on solo diving. His trips are probably the first commercial operation in dive history to allow, teach and encourage solo divers. He introduced the Mike Ball Safe Solo System in 1997. Mike told me that someone who “wants” to solo dive is probably already 90 percent ready to. It is like hiking; a hiker who wants to hike alone is most likely already mostly mentally prepared and properly geared-up for the task. By encouraging the course, divers are properly trained, which helps with individual safety as well as safety of the company, and just like any scuba course, completion is determined by the instructor; if they don’t think you’re ready, they won’t certify you. Divers enjoy their trip more because they are diving how they want, and the dive guides can focus their attention on divers who may need or want a little more guidance underwater. I would venture to say, this course is for everyone, but the act of diving solo is NOT for everyone. The course teaches a diver to be more self-reliant and discusses a lot of common-sense issues about what to do if alone during an emergency. In classical buddy-oriented courses, subjects like these are ignored because they focus entirely on a diver never being alone. Always being with your buddy is a great practice, but in reality, sometimes situations occur where you end up alone even when you tried not to be. This course can help a diver be prepared for those less-than-perfect situations. Brandi Mueller is a PADI IDC Staff Instructor and boat captain living in the Marshall Islands. When she’s not teaching scuba or driving boats, she’s most happy traveling and being underwater with a camera. For more information, visit: www.brandiunderwater.com.